People who believe their fingers, arms or other parts of their body are “double jointed” may not realize they could have a condition known as Ehler Danlos Syndrome (EDS). EDS Hypermobility is a connective tissue disorder in which various parts of the body move beyond what is considered to be normal. EDS is thought to be a genetic collagen abnormality where the surrounding tendons and ligaments are “overly elastic”, allowing the joints to move in an exaggerated position. While EDS is known to affect the neck, shoulders, back, hips and knees, many experience symptoms in their smaller joints as well, such as the hands, thumbs, wrists and elbows. These abnormally flexible or “loose joints” are prone to an increased risk of injury and dislocation which can cause chronic discomfort and pain. Managing the pain of EDS Hypermobility can be challenging. Unfortunately, relieving discomfort through medication is limited, as the underlying problem is caused from joint looseness and not from inflammation. Many have found that an effective and important tool for the pain management of EDS is through splinting and bracing. Splints and braces work to support a joint in a neutral position, while still allowing daily activities without pain. Supporting joints with a splint or brace allows freedom of movement, but within a normal range – which helps to reduce ligament and tendon sprains and dislocations. There are a variety of splints that a health care professional or occupational therapist may recommend to provide differing levels of stability and protection. Neoprene wraps, braces and light thermoplastic splints may all help to provide support and pain relief. Custom made splints may also be helpful, as adjustments can be made to them based on individual needs. Looking for Information on Splints and Braces that Can Help With EDS? i have had my first joints at my fingertips of both my hands pointing downward since I can remember. I do NOT have the middle joints flexed like true Swan fingers, mine are like in a permanent claw at the tips. when u turn my hand over like a “Palm Reader” MOST have 3 lines on their fingers 1 at base of palm and fingers, 1 at the middle joint and at the 1 last joint at end of fingers when you forcibly make my fingers straight I only have two bending lines one at base and middle I have no finger tip line at the ends of my finger joints in BOTH hands. I have had diagnosis of fibromylagia, ‘early arthritis I think they are wrong can you help me? 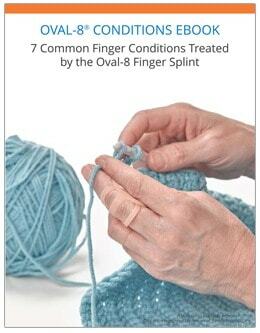 I am very sorry to hear you are experiencing problems with your fingers. As we are not medical professionals, we are unable to provide you with a diagnosis for your problem. We suggest that you get a second opinion from a healthcare professional or a specialist who can re-examine your hands and perform a thorough evaluation. You may wish to visit this link on our website http://www.ohmyarthritis.com/contactus.aspx to help find a hand specialist near you who can make certain you have a proper diagnosis and treatment plan. I hope you find answers to your hand problem very soon.